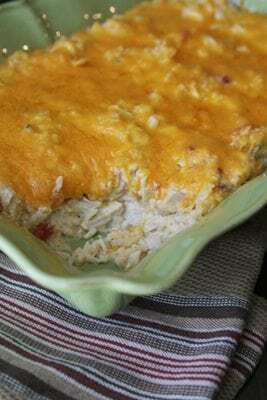 This Mexican Chicken Casserole is a quick and easy family hit! I hope you enjoyed all of the great apple recipes on Southern Plate last week! I’m working on getting ready for the Southern Living Taste Of Charleston Food and Wine Festival next week and also in the planning stages on my Holiday Cooking Show so today my friend (and adopted brother) Stacey Little is doing a guest post that I know you’ll enjoy. You’ll also see why he is my adopted brother. We share the same heart on so many things! If you enjoy Stacey’s post today, be sure and leave a comment below and visit him over on his blog when you get a chance at Southern Bite! Have a fabulous Tuesday and I’ll be back with a new post from me in a day or two! I’m thrilled to be able to come back and visit with you and honored that Christy invited me to post! 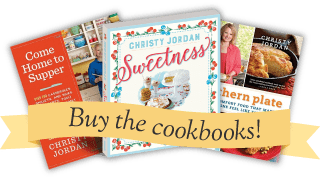 I have loved being a member of the Southern Plate Family for a couple of years now and getting to share one of my own recipes with you is always a fun treat for me. Today I thought I’d share something that is on my heart because I know it will resonate with you as much as it did me. The other day a dear friend of mine posted something on Facebook that really got my attention. Under the title “wisdom” she posted the following excerpt from Anna Quindlen. The message struck a chord with me and I haven’t been able to shake it. “The biggest mistake I made [as a parent] is that I did not live in the moment enough. This is particularly clear now that the moment is gone, captured only in photographs. There is one picture of my kids sitting in the grass on a quilt on a summer day, ages six, four, and one. And I wish I could remember what we ate, and what we talked about, and how they sounded, and how they looked when they slept that night. The unfortunate part about living in a world that is constantly connected and ever-changing, is that we frequently forget to slow down and notice the small things that can make each day extraordinary. Ever since I read this, I’ve been making a concerted effort to notice those small things – the way my little boy talks, the way he eats, the way he smells after a bath. You might find my living room floor scattered with toys, my car may be littered with baby wipes and candy wrappers, and there might be a dozen loads of laundry to be done, but I’m going to make the effort to stop each day and pay attention to the other things – the more important things. Our days here are numbered and I’m positive that when I look back and remember the inflection in my little boy’s voice the time he told me I was his best friend, that pile of laundry and that dirty car won’t even be on the radar screen. Do me a favor. Sit down with your family at dinner tonight and just be. Turn off the television, the smart phones, and computers. Ask, “How was your day?” and mean it. Don’t expect the same old “good”. Make a real effort to learn how your family’s days were. Reconnect. It’s past due. Trust me. Now lets make a supper for you to sit down to. 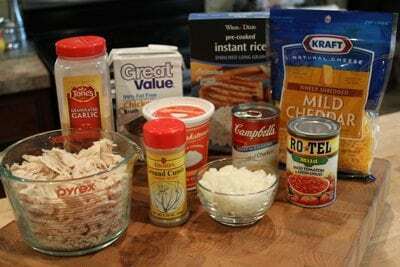 You’ll need: cooked chicken, instant rice, cream of chicken soup, sour cream, frozen diced onion, shredded cheddar cheese, Ro*Tel tomatoes, some cumin, garlic powder, and chicken broth. Dump all of the first nine ingredients and half of the cheddar cheese in a large bowl and stir to combine. Next, turn the mixture out into a greased casserole dish (9X13). Again, very scientific. Then top with remaining cheese. 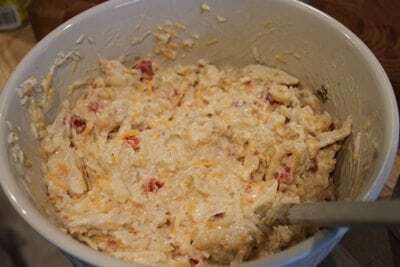 Combine all ingredients and half of cheddar cheese in a large bowl. Mix well. 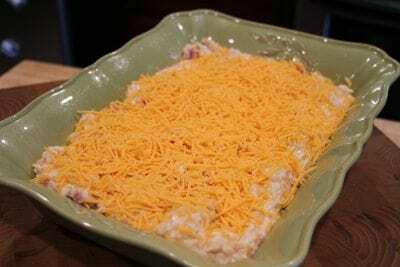 Turn out into a greased casserole dish and top with remaining cheese. Bake at 350 degrees F for 30 minutes, or until hot and bubbly. Submitted by Rejoiced Over. Submit your quote to our collection by clicking here. Wow, that sure is easy looking! I’ll bet it tastes good too. I grew up eating dinner at the table with my family sans TV or any other interruptions and my husband and I do the same the vast majority of the time. It’s always been the norm for me and I’m quite thankful. Stacy, I’m already a huge fan of yours and have tried many of your recipes and love them! 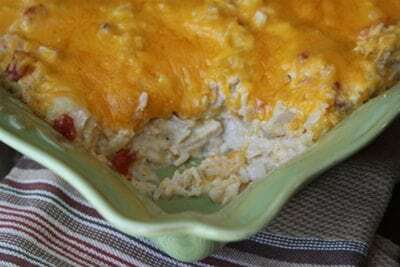 I made a casserole almost exactly like this last night (only 2 ingredients were different) I thought it was going to be a big hit with everyone but my son complained about the onion texture. Thanks for the frozen onion tip, I’ll definitely have to remember that! I’ll be the first to admit my life is full of clutter, but I wouldn’t trade it for the world for the memories I have with my family! Aww, you are too sweet! The frozen onions really make a huge difference. Pretty easy & I actually think I have all these ingredients! LOL! That’s the way it should be! I have same receipe, but use spaghetti noodles that you cook in chicken broth. Everything else is same. Delicious. Scott, I got very misty eyed reading that quote by Quindlen and your thoughts. My boys are 13 and 15 and just this morning I was exasperated beyond words with the mess (created by them for the most part) that was/is my house and I was short with both of them. We’ll be sitting down for dinner tonight and I’ll be working on keeping the good stuff close to my heart. Thanks for the recipe too. It’s amazing just how connected having dinner together can make you feel. Even if it’s hot dogs, we always sit together and talk about our day. Thanks, Stacey, for sharing this great-looking recipe: delicious, simple to prepare, w/everyday ingredients… just the kind I like. 🙂 Cannot wait to try it!!! Been looking for a chicken recipe that my kiddos will actually eat. This looks fabulous and I actually have all the ingredients! Looks like I’ll be trying this out for supper tonight. It’s probably the most special part of my day. We are so rushed, but we always make time to have dinner together. Not sure why we have to say “in a pinch” about convenience items such as pre-chopped (frozen) onions, peppers, etc. I’ll just come right out here and admit that I HATE chopping. If I can find it pre-chopped, as a working wife, I’m going to use it. It helps me put a meal on the table and there’s nothing wrong with it. Just saying. 🙂 Hello, I’m Deanna and I’m a pre-chopped food user! LOL! Hi Deanna, My name is Stacey and I’m a pre-chopped food user, too. Convenience foods make it easier to get wholesome food on the table for our families and who’s going to balk at that, right??? Okay I took my happy little pre-chopped self to the store, got the stuff to make this, and had a yummy dinner last night. Of course, I already had the chopped frozen onions in the freezer! LOL! I will adjust a few things to our taste, like most recipes I try, but this is a keeper! Hubby liked it too!Thanks Stacey! Thank you for the post. We eat as a family, but I have been realizing we need to slow down and enjoy the time we have with our four children. Right now my four yr old is singing in the shower, me ten yr old is working on english, thirteen yr old doing algebra next to me,( because it’s easier when your near mom), and fifteen yr old. Reading on the couch Little Women for lit and the dog at my feet. I am so blessed! You are so blessed! I love those moments when you just stop and take it all in and realize how fortunate you are. Seems like you just had one of those moments. The recipe looks great and I love the short prep time and everyday ingredients. I wholeheartedly agree with your philosophical remarks. I am nearing 65 and I have gained in wisdom over the years. Enjoy every moment of your childrearing years as you don’t get do-overs. Years from now your children will not say mom or dad had the cleanest floors in our town , but they will remember the day they rolled and decorated sugar cookies. You are so right! Thanks for sharing! Do you cook the rice first or just dump it in uncooked? I would add it uncooked. Since it is instant rice it will cook fast while it is in the oven. Stacey thank you for those wise words that everyone should read and follow. The recipe sounds terrific and will make this weekend. You are so welcome! I hope y’all enjoy it! Christy, I can’t thank you enough. Just made some apple butter using your crockpot recipe. It came out great. I got 2 qts and two 1/2 pints. And a little left over for sampling. It was amazing. Now I can make apple butter anytime I want. It’s so easy and my husband loves apple butter. I used 1/2 sugar and 1/2 splenda, because he’s a diabetic. Could not taste splenda in it at all. Many, many thanks!!! Ok, here’s a dumb question. What are Ro*Tel tomatoes? Oh, and I was wondering the same thing about the rice – cooked or uncooked? It looks great! Can’t wait to try it out. Uncooked rice. Just dump it all in there. Ro*Tel tomatoes are a canned blend of tomatoes and green chiles. You can also find the generic bland listed simply as Tomatoes and Green Chiles. This looks delicious and easy. Just the way I like it. I can so relate to your post today. As I am constantly trying to do it all, and I know we as a family are missing out on just being. We do need to get back to the table. Thanks for the reminder! You’re welcome! I hope you find that time around the table as special as we do! Love easy and fast recipes!!! This looks wonderful. Christy what did you eat with this? I’m so not use to having just a casserole without something else, hehe. Looking forward to making this great dish. This dish has your protein, carbs, dairy and veggies, but like you, I felt like we needed something else. I think we had green beans with it. Not sure if it goes or not, but that’s what we did! LOL! Thanks, Stacey, for the recipe & the inspirational story! I always enjoy your “guest posts” on Southern Plate! Thanks, Sabrina! I always enjoy my guest posts over here too! I’ll have to check that out! Thanks for sharing! I have basically the same recipe. The only major difference is the addition of a 4oz can of diced green chilies or if you want just a bit more hear use a 4oz can of diced jalapenos. The addition of some crushed tortilla chips to the cheese on top adds a nice crunch to the topping. Sounds delish! Thanks for the variation! I love the quote…the great thing about being a grandparent is being with the kids and living in the moment. I enjoy every precious moment with them because i remember how fast the time goes when you are raising children. I remember being frustrated with the house and then saying “the heck with it, it’s not going anywhere but the kids will grow and I’ll never have this moment again.” Needless to say I stayed up late at night to catch up, but it was well worth it. Recipe looks yummy, will have to give it a try. I am so fortunate to have a wife and a little boy who make me realize that each day. Blowing bubbles with my little man beats washing dishes any day! You know, if you don’t have anything nice to say, you don’t have to comment. I agree with Beth. If you can’t agree just be quiet. No use in spoiling everyone’s day. I live by myself and probably won’t make the casserole, but think it sounds very good. If I still had my family would be having it for supper. Thanks for your recipe and also the good thoughts you left with us. should the rice be already cooked when you add it to the rest of the stuff? about how many servings will this make? I work with a bunch of guys, all with big appetites…I think they would love this recipe, but want to be sure and have enough to feed everyone. I think you could feed 5 or 6 folks without much problem. I hope you enjoy it, Auntie! Good morning, Stacey! I already follow your posts and am happy to see you over here today with such a good looking recipe. Bet I could buy one of the whole baked chickens at Kroger and make that recipe even easier, couldn’t I? Thanks so much! Absolutely! A rotisserie chicken would be perfect in this recipe! Stacey – what a lovely quote…we all have regrets…I am trying to do better with my grandson. Whenever he says/does something adorable/sweet, I enter it into my folder of Keeganisms. Such as the first time he saw regular sand at the beach compared to the white sands of the FL panhandle – he looked down and said, ” UGH – Kitty Litter”. How funny! I wish I had the time to do something just like that. One of the most wonderful gifts I’ve ever gotten was from my Mom. She kept a diary of my entire senior year of high school and gave it to me at graduation. Now, it’s so neat to go back and be reminded of all those days! Oh Good heavens Stacey, just realized I called you Scott. Coffee hadn’t kicked in yet…LOL!